Researchers led by Johns Hopkins Kimmel Cancer Center scientists report they have developed a free web-based app that could take some of the guesswork out of decisions to order an additional and costly molecular test for assessing risk for recurrence in women with early-stage breast cancer. The app, described online Oct. 10 in the Journal of Clinical Oncology, uses routine data provided by a pathologist's analysis of a patient's breast tumor biopsy to predict the recurrence risk category generated by commercially available molecular tests. One such test, OncotypeDX, made by Genomic Health, detects alterations in genes linked to aggressive breast cancers that are more likely to recur and costs approximately $4,200 in the U.S. The Johns Hopkins scientists say that determining a patient's risk for recurrence is a major factor in determining the need for chemotherapy and anti-hormone medications after surgery to remove an early-stage tumor. "While such tests can be informative, clinicians ideally should use them when there is a gray zone in which high-quality pathology measures alone do not give doctors all the information they need. Molecular tests should complement, not duplicate, information that is already available," says Antonio Wolff, M.D., professor of oncology at the Johns Hopkins University School of Medicine and member of the Kimmel Cancer Center. 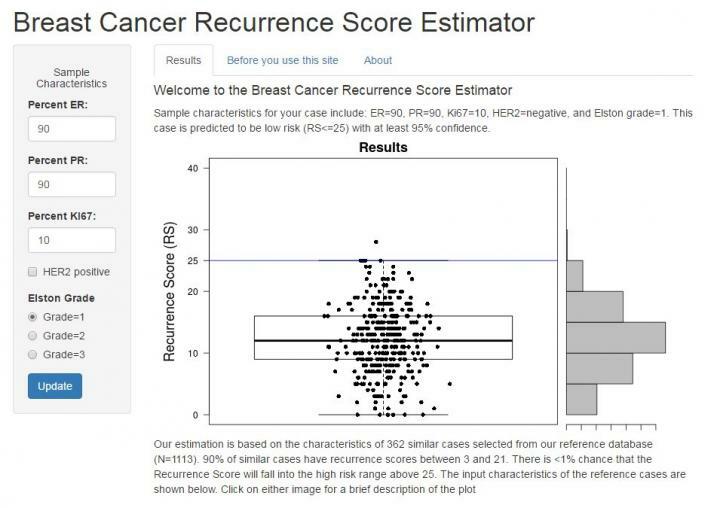 The Johns Hopkins scientists developed their app, called the Breast Cancer Recurrence Score Estimator, based on information extracted from the medical records of 1,113 patients treated at five hospitals in the U.S., including The Johns Hopkins Hospital, for stage 1 or 2 breast cancer that was estrogen receptor-positive and had the OncotypeDX test done. The team used data from 472 additional patients from three of the hospitals to test the estimator and identified the risk category predicted by the OncotypeDX test for 248 of the patients (53 percent), with an accuracy of 97 percent. In the remaining 224 patients, the app was not able to predict OncotypeDX's risk score with certainty, says Leslie Cope, Ph.D., associate professor of oncology at the Johns Hopkins University School of Medicine and Kimmel Cancer Center member. The app may not change the total number of molecular tests ordered at any particular hospital, but it may shift ordering of the tests to cases where pathology measures are more ambiguous, report the scientists. The investigators also looked at what would happen if doctors at Johns Hopkins used this app, rather than their own intuition, to decide when to request the molecular test. They said that their analysis in 939 patients suggested that by using the app, they would have ordered 297 tests, instead of the 299 tests actually ordered. This is essentially the same total number of tests but now includes a very different group of patients for whom the molecular test would add the most information, says Cope. To use the app, doctors enter information from pathologists' examination of a tumor, including levels of a protein called Ki67, an indicator of growth rate; the cancer's grade, which identifies the degree of tissue differentiation; the tumor cells' ability to bind to the female hormones estrogen and progesterone; and increased expression of a gene called HER2, known to trigger faster growth of breast cancers. The app provides doctors with an overall estimate of the OncotypeDX risk category — high or low — which aims to predict whether a patient's cancer will recur by the end of 10 years and if additional therapy might reduce the recurrence risk in a meaningful way, says Wolff. "Before doctors begin using this app routinely, we ask them to test it on a group of their own patients," says Christopher Umbricht, M.D., Ph.D., associate professor of surgery at the Johns Hopkins University School of Medicine and member of the Kimmel Cancer Center. The app's website includes information on testing additional patient populations, and the investigators say they hope that other scientists will join them in efforts to improve the app. A similar app has been developed by the University of Pittsburgh using different pathology data. In addition to Wolff, Cope and Umbricht, the following scientists contributed to the research: Hyun-seok Kim, Peter B. Illei, Ashley Cimino-Mathews, Soonweng Cho, Nivedita Chowdhury, Maria Christina Figueroa-Magalhaes, Catherine Pesce, Stacie C. Jeter, Charles Mylander, Martin Rosman, Lorraine Tafra, Deborah Armstrong, Roisin M. Connolly, John H. Fetting, Robert S. Miller, Ben Ho Park, Vered Stearns and Kala Visvanathan from Johns Hopkins; Bradley M. Turner and David G. Hicks from Anne Arundel Medical Center; Tyler A. Jensen from the University of Rochester Medical Center; and Dylan V. Miller from Intermountain Healthcare. Funding for the research and development of the app was provided by National Cancer Institute (CA006973) and the Susan G. Komen Foundation (SAC110053, KG 110094).